Travelers tend to be restless creatures. A few manage to snip the roots at their feet and blow around the globe like a tumbleweed. Most of us, though, have roots in a place we call home and get itchy when it’s been too long since our last adventure. No matter what kind of traveler you are, though, our dreams are built on the wind. We scatter to the far reaches of the earth, going where the wind blows. So, when I came across an article by NPR’s Robert Krulwich which talks about how wind works and shows a work of art made up of wind patterns across the United States, I couldn’t help but be drawn to it, and want to share it with other travelers who might get lost in the patterns as I did. A snapshot of the Wind Map from March 21, 2012. Photo from NPR.org and hint.fm. The Wind Map by Fernanda Viegas and Martin Wattenberg looks like something dreams are made of while actually being made up of cold, hard data from the National Digital Forecast Database. 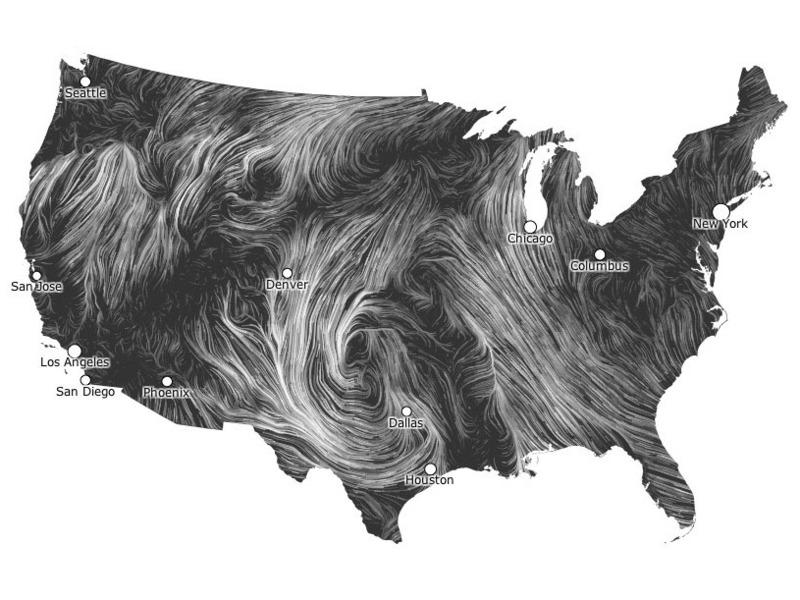 The animated map shows wind patterns in near real-time, composed of that data collected throughout the day. Below is a video of the wind as it blew on March 28, 2012. To see the patterns of the wind as they blew through the US today, visit Viegas and Wattenberg’s website here. On their website, they mention that they are working toward providing Wind Maps for other parts of the world. Now that you’ve seen the wind in action, where will it take you next?